Danny Glover, Tony Danza, Christopher Lloyd, Brenda Fricker, Ben Johnson, Joseph Gordon- Leavitt, Jay O.Sanders. 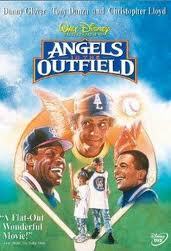 Angels in the Outfield is a remake of the 1951 Clarence Brown movie with Paul Douglas and Janet Leigh. This is a film updated to the '90s (with echoes of films about angels - Heaven Can Wait - which have been popular in the '70s and '80s). The film was very popular in the United States, relying on interest in basketball - however, it is rather cute and sentimental. Brenda Fricker has a cameo as the woman in charge of the home for the orphans. 1. An entertainment for the family? American audiences and baseball? A remake of a '50s film? Comparisons? 2. The baseball sequences, action? The atmosphere of the neighbourhoods? The special effects for the angels? Musical score? 3. The title, the plausibility of the plot, fantasy? 4. Roger and J.P., two young boys, race relationships, the foster home, Maggie looking after them, their love for baseball, the bonds between them, the father and his word, the angels and the champions? J.P. as shy? Roger being forward? 5. Danny Glover as George Knox, style, manager, relationship with the players, the games, the boys? The angels and the growing success? Communication with the boys? On tour? 6. Mel Clark and his abilities, playing the games, the injury, the need for angelic help, the friendship with the boys, the final game, success? 7. The background of families and adoption, the family court, parents, losing the case? 8. The commentator and the news, the papers and the story, the owner and his scepticism and speech? The press conference and faith in the angels? 9. Maggie, personality, her style, at the home, with the boys, going to court, her care? 10. The owner, the pressure on the team, the winning, the losing, the press conference? 11. Christopher Lloyd as Al, the angel? Appearance, appearances, helping, the signals, the comedy? 12. The theme of the angels helping the team? Their winning by themselves? The boys, the signs, the team psyching themselves to win, the signals, the flapping of the arms...? 13. The happy ending? The adoption?